Our corporate gifts are not available to order online. 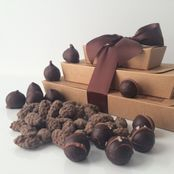 To place an order please us at jane@jchocolatier.com. Shipping is available for an additional charge. 2 weeks lead-time on large orders is appreciated. Our most popular gift. A nice selection of fruit, nuts and bon-bons. *Add other items from the a la carte list below (optional). **Packed in a kraft-colored gift bag with decorative tissue paper and satin ribbon. See photo at top of page. Great for gifts sent to an office staff or large group. Double-Decker Gift Tower plus a sampling of our other treats. The ultimate chocolate experience. Small gifts. Perfect to give out to staff members or individual clients.